SEO? Ain’t Nobody Got Time Fo’ That! Today’s internet is incredibly fast moving. In my many years as an internet marketer I have observed (and been party to) the quickening pace, but things really seem to have accelerated over the past year. I am seeing lots of new sites popping up and achieving rapid growth, generating eye watering amounts of traffic in very short periods of time. And this rapid early growth is not fueled by SEO – at least not in the traditional sense. If google originally envisioned a truly democratic web, where the best content and ideas would be ‘voted’ to the top by the internet hive mind, then it can now be said that we are living in the Internet’s golden age of democracy. But the fuel for this golden age is not links as google originally envisaged, nor does google hold a majority in this socially democratic web. If google continues to govern, then it now governs in a rainbow coalition with the blues, reds and oranges of the social web, and indeed relies on its myriad partners to dictate much of its policy. Let me be clear however, that this does not in any way mean that google has failed. Since day one, google has been very clear in its aims – it wants to rank popular content. While the exact method google uses to determine this popularity may have changed over the years, the ultimate goal has remained the same – and it is perhaps only now that it is finally in a position to fully achieve that goal. That being said, it is understandable that many startups are choosing to focus their attentions (and budgets) on social media. Growth through SEO can seem painfully slow when compared to the rocket boosted potential of social media. As a personal example, I launched a new site at the end of November 2014 (specifically the 23rd), and in January of 2015 the site received just under 250,000 visitors. Needless to say, the overwhelming majority of this traffic was from social media. For transparency, I did put some budget into facebook ads. As you will see below my total spend in January 2015 was £345.49. For what (at the time) was a small site (certainly under 100 pages) it is clear that this level of traffic would not have been achievable in the same timeframe with traditional SEO. The bulk of the traffic in January 2015 was to 2 or 3 posts, which to some extent went ‘viral’ (although admittedly not at buzzfeed/viralnova scale). Looking at one post specifically, watch how the percentage of organic search traffic rises month by month. Understandably, we see very little search traffic. The few visits are probably the result of people pasting the URL into a google search. 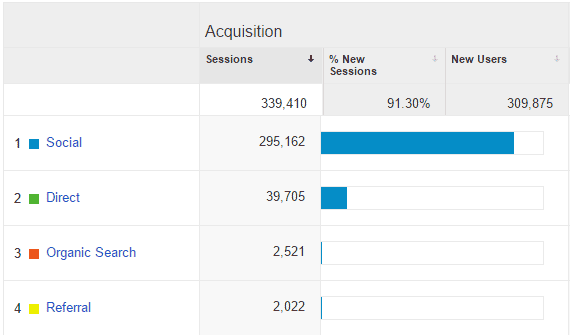 A doubling of organic traffic and google moves to position 5. Big jump. Google becomes the second biggest referer to the page, bringing in just under 4,000 visitors. The upward trend continues and in April google refers over 5,000 visitors to the page. At the time of writing (22nd May), google has so far referred 4,732 visitors to the page in May. Assuming the trend continues (average of 215 per day), by the end of the month the page should have received between 6,000 and 7,000 organic visitors from google. So why is the page ranking? Well, to start with, it might be easier to look at what we can discount. However, this page has under 300 words of text. So, let’s put a line through that. Has the page been steadily accumulating organic links over the period? 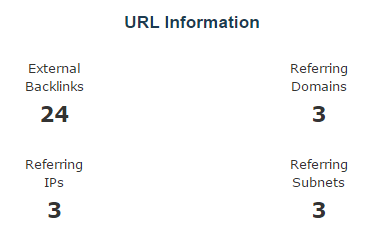 From these links the page has accumulated a trust flow of 0 and a citation flow of 13. I will caveat the above by saying I believe there may be a few more links than that, but I do mean a few. Is the organic traffic increasing due to an improving domain authority for the site? Again, I doubt it. 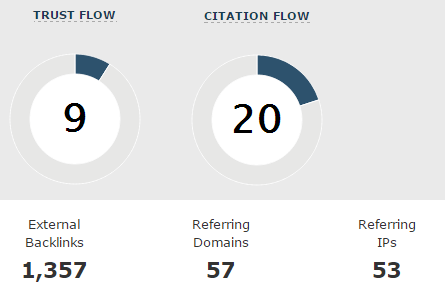 The stats are hardly anything to write home about, although it should be stated that these are all completely organic links (I have done no outreach/link building). Ok, this one is a bit of an unknown. It could certainly be that there is an element of rankings improving as the domain ages (and the impact of any ‘sandbox’ effect begins to lessen). If that were the case however I would expect to see rankings improving at a similar level across the site, particularly for the longer form content (there are several articles over 5,000 words long). While there is a steady increase in organic traffic overall, it is not at anywhere near the level that this page is growing. As I can’t completely discount it however, we’ll put a question mark beside it. Note: I should also state at this point, that this page isn’t targeting what I would class as a high volume keyword or anything like that (but it does have a lot of competition, including some very well know/entrenched sites). From looking at webmaster tools data, it appears to be ranking across the board for a whole range of related phrases, which are cumulatively bringing in decent numbers. Another point of interest is that the actual word that is bringing in the most traffic (across a number of phrases) is not even mentioned anywhere on the page (either in the title or the body content). That’s a lot of activity/buzz. I’ll let you form your own opinion on whether that has influenced rankings. I am definitely a subscriber to the theory that google uses click-through rate as a ranking signal, and that if a site is not receiving a decent percentage of click-throughs relative to it’s position in a SERP, it will be demoted. Conversely results with high click-through rates are likely to see their rankings improve. It just makes sense. This data from Advanced Web Ranking (taken from ‘A New Click Through Rate Study For Google Organic Results’ marketingland) shows that this is broadly in line with what we should be expecting to see for position 1, and above average for positions 2-5. From this data it could be proposed that click-through rate may have had a positive effect on rankings. Certainly I would not have expected it to have any negative effect. Going back to our monthly stats and my theory that the initial organic traffic would have been people pasting the URL into google, this is where we could be looking at a very strong ranking signal. Get lots of this over a period and what is google going to think? This is popular (and not artificially so). I should show it to more people. People get hung up on bounce rate, which is correct (you want people to stay on your site & fulfill a goal), but for the wrong reasons. This page actually has quite a high bounce rate in google analytics of around 73% (I’m working on getting it down!). But that’s not the type of bounce that will affect an individual pages rankings (generally). The type of bounce you should really be worried about is when someone visits your page, then clicks back and clicks the next result in the SERP. That’s telling google that your page did not satisfy the query. I suspect that this page does satisfy user intent (the social shares etc would be testament to that) and that most visitors would not go back the search results and click on the next listing. 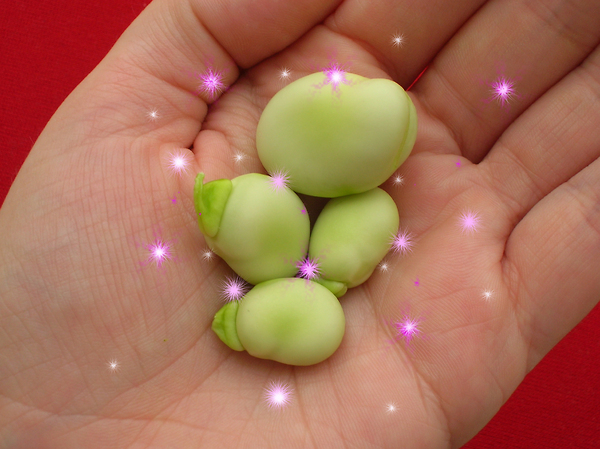 Popular content + branded/specific searches for the content = higher search visibility for the content + solid click-through + satisfy user intent = SEO magic beans! So where am I going with all this…? Well, it really boils down to one thing. It’s getting harder and harder to fake the popularity signals required to rank in google. I’m not saying link building is dead, far from it, but everything you do should start with creating the best possible user experience you can, and putting out content (be that text, videos, photographs, or screaming goat gifs) that your visitors will naturally want to share. I know it’s boring. But it’s true. When you combine the above with a solid, outreach based link building campaign (or PR campaign, whatever you want to call it), then that’s when the magic happens. No beans required. SEO? Everybody’ got time fo’ that! SEO today does not work in splendid isolation – it’s part of the whole: user experience, content creation, driving traffic (through various channels) and content amplification. 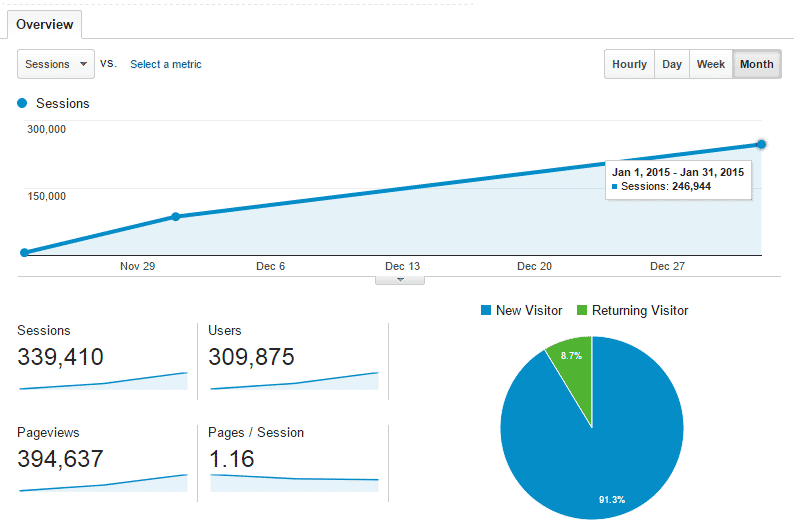 I read a guest post on Matthew Woodward’s blog last week that was all about faking using metrics. I get it, and it’s not unexpected, but it was a depressing read and had me seeking out the nearest wall to bang my head against. A good SEO does not have to fake anything. A good SEO knows how to create a great user experience, and content that will resonate with the site’s target audience. They know how to ensure that that same content will fulfill search intent, and they know how to tweak how a page is displayed in a search result to maximise click-throughs. 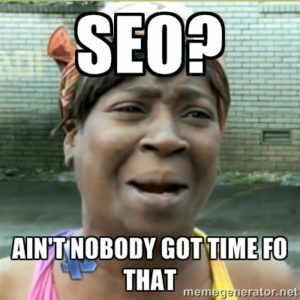 Far from being something you ‘don’t have time fo’, SEO should be part of your strategy from day 1. But if your SEO is only interested in creating something that’s artificial with cheap links and fake metrics, then it’s time to find a new SEO. Well that’s good news, on the basis that it’s more within one’s own power to crowd-source attention than to provide information that other webmasters want to link to. I’ve thought for a long time that G’s model of relying on links must be questionable even without the problem of hidden paid links etc. The model made sense in the day when relatively few people made their own site, but now that there are almost no barriers to creating a site, the world has changed and G must change with it. My first thought is, what site is it that you made? Sites that teach people how to make popular sites tend to do well, and as you are in SEO I am guessing that that is what the site is about. But maybe not. And my second thought is that if you did it off the back of a reputation that you already had, then some of the magic bean sauce is you, rather than the site. Is that the case here? Also, what did you spend your FaceBook ad money on? I’ll be doing a separate article about the site soon, but it’s not in the SEO/IM space. It’s a viral news/entertainment style site and doesn’t have my name attached to it directly. Facebook ads was a mixture of page likes and promoting content/videos (about 50/50). To be honest, I probably wouldn’t bother with the page likes if I was starting again though and just spend the full budget on promoting content. Thanks, I look forward to reading the article. Been here before and will be back again, great article David. I love the points about bounce rate. I have not thought about that signal in the way you outlined it before, considering a user hitting back and then selecting an alternative result and Google looking at both the fact they bounced and then the fact they bounced to a better result. I also think as much as Google deny they use social media as a signal, I doubt it based on personal results across 20+ websites over the last 5 years. I often see un-explainable surges of organic targeted traffic after social media marketing. I guess it would be a smart strategic move for Google to keep quiet about their use of social signals considering the social sites are outside of their ecosystem and not under their total control, also some of them are in direct or some cross over competition, since Facebook wants to try search albeit miserably and Google trying social media over and over again also albeit miserably. I would love to discuss a couple of things with you sometime, we talked briefly before about a site I setup as a bit of a tongue in cheek SEO experiment, that is coming along yet there are some open ends I am still uncertain of in terms of direction. P.S it’s like the David show up in here on the comments right now. 3 Davids! Should probably form a super crew! ha. Totally agree, the name thing too! Sure, i will drop you an email, I think we both ended up crazy busy over that period and never had a chance to properly talk so will follow that up today. Thanks, enjoy the bank holiday. Great to see you blogging again – don’t leave it so long next time! From testing and observation on my own site, I’m in no doubt whatsoever that Google are using social signals as a ranking signal. And, from looking at Google Analytics, I have also seen a correlation between branded and URL searches and a huge traffic increase site-wide. Whether or nor this is related is up for debate, but I hardly doubt it’s coincidental, and it would definitely corroborate your theories. Also, my site has a relatively high bounce rate (around 70%), which has also had no effect on rankings at all, so agree with you that this seems to be a less important signal than something like click through rate etc. And I like Matthew Woodward, but, honestly, he can’t have his readers best interests at heart with some of the advice he dishes out – it’s SEO suicide! I think people have to start putting on-site bounce rate into context. If you have an ecommerce site with a high bounce rate then clearly you need to get that down, as a visitor will need to visit multiple pages to complete a goal. Say you have an affiliate site with price comparison though: you want visitors to land on a specific page, then click out to an offer. Better still if they have read the best review they can on the product (so have spent a good few minutes on the page) and are pre-sold before they click. As long as they don’t go back to google, your page has satisfied their query. And it’s not thin content or anything if there is an actual value to your page. I see a wide range of bounce rates across my different sites (from very low to very high), but I’m more concerned about percentage of visitors that are completing goals. Great article, really enjoyed reading it. For someone new to SEO and digital PR, I found it both in-depth but not too heavy or over my head. Thanks Matthew, glad you found it helpful. “People copying and pasting the URL into google” – yes, it’s very common bahaviour. They pasting the URL even if they wan to get to Facebook or Twitter. Where’s logic? Mayby that’s why Google take this bahaviour as a ranking signal. I never really took much notice of the bounce rate until you outlined it in such great detail. I’m currently floating around the 60% mark, but I am hoping to lower this by incorporating the magic SEO bean formula you outlined! This is the first SEO-based article I’ve read in years that I could actually take a thing or two away from. I’ve only ever run Facebook ads to promote page likes and get the ball rolling for a new page. I’ve never considered using them to drive traffic directly to my, or my clients, sites. I guess it makes perfect sense though. Genuine social signals are clearly no joke! Love the part about the number of people typing or pasting a URL directly into their browser being a potential ranking factor. I’ve wondered for a while if Google collect more data from Chrome than we realise. What’s stopping them from taking Chrome bookmarks into consideration as a ranking factor? I bookmark decent content that I want to read later or read again, and, to my knowledge, not something that’s being abused or offered as a server (yet). © 2018 Top 5 SEO.